Call Us and Get On the PodCast! We've added a new feature to the podcast! Now, you can call us and leave us your thoughts, answer our "question of the month," or othewise participate in the PodCast. If you call, your message may be featured! When you call, give us your first name, your location and your comment or answer to our question. Call today and tell us what you think about podcasting, storytelling or the storyteller.net podcast. Maybe you have a question about storytelling? Call and ask! The number is 206-600-6172 (country code is 1 if you need that.). Call us and talk back! May 2006 Storyteller.net PodCast. Listen up, youse. The new (free of charge) Storyteller.net Amphitheater:PodCast Edition for May 2006 is now online! Click Here to Hear It Now! In 30 minutes, we include three stories- "The One Bedroom Apartment" by Kindra Gayle, "Two Farthings" by Sean Buvala and "Grandpa Al and Max" by Glenda Bonin. There's a coaching moment with Sean Buvala and a CD review of "The Family Gazette." Sponsored this month by storytellingproducts.com. Sean Buvala (host, stories and coaching): .http://www.seantells.com. CD: "The Family Gazette" : At Storytellingproducts.com . Here Comes the New Podcast! 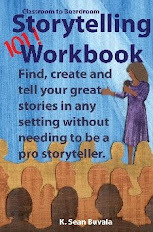 I have a storytelling friend who's listed on our site at Storyteller.net. Her name is Priscilla Howe. You can find her web site at www.priscillahowe.com. At any rate, one of the things that Priscilla Howe does as she travels across the country is intentionally seeking out what she refers to as the "world's best pie." Maybe I'm getting the name of her exact quest wrong, I don't know. However, she has inspired me to also pay attention to the food that I eat when I'm on the road. It's very easy to just shove food in your face when you're traveling. One of the rules of the road is: If you find food, eat it. The idea is that you don't always know where your next meal is coming from. For those of you who travel frequently, you probably know exactly what I am talking about. So, on the one of my recent road trips, after driving for two hours, I had a chance to stop and eat and change my shirt before my next event. Now, I didn't change my shirt because I was going to spill food all over it, but because I had worn a shirt that I had been sweating in the car and I thought I should not give the people who booked me the treat of smelling me as well as hearing me. After ordering and eating the soup of the day, I thought I would treat myself to a Boston Cream Pie. Now if you know anything about pie at all, you know that a Boston Cream Pie is usually some type of chocolate pudding-like base covered with whipped cream over a standard yellow crust. I can say to you at this time that Priscilla's search for the best pie in the world does not need to occur in Prescott, Arizona. I might get sued if I actually tell you the name of the restaurant that served me this really awful Boston Cream Pie. Let's just say that this pie, well at least the chocolate part of the pie, was one of the most awful experiences in food I had ever had. The chocolate was a mixture of melted chocolate chips along with some wax that had apparently been scraped off the altar of a local church. I'm sure there was some type of gelatin in the chocolate as part of this dietary destruction that was happening on my plate. I'm not kidding, the chocolate actually wiggled on the plate. And I don't think it was because of me bumping the table. It was just wiggling of its own accord. I don't think that there is anything that you are supposed to learn from my experience. I just know that if Priscilla ever had a chance to come to the northern section of Arizona, there is one restaurant that she can mark off her list. She won't find the best pie in the world at this place. Sigh. I'm just sorry that I had to discover this pie. At least it wasn't as bad as the "shrimp on toast" that my team was once subject to in South Dakota. But that, as they say, is a story for another time.